Antique Piano Stool w/ Victorian Twisted Wrought Iron Metal Base Oak Round Seat.very nice condition, solid,Shipped with USPS Parcel Select Ground. 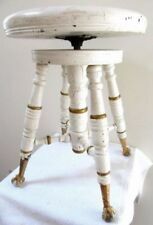 Up for your consideration is a antique Victorian Piano Stool. Wrought Iron Lyre Decorated Feet/legs. Adjustable seat height. It does have defects from age. It could use recovered if desired. Sold as is only. The finish is not in perfect condition it's old and been used, I tried to show all its flaws in pictures. This is a very sturdy stool. Original wood tones, molded seat swivels to adjust up and down. BEAUTIFUL SCROLL STYLE GOUT STOOL. NEEDLEPOINT TOP GORGEOUS . LOVELY NEEDLEPOINT WITH FLORAL PATTERN ON TOP. LIGHTLY PADDED UNDER THE NEEDLEPOINT FOR COMFORT. THE STOOL IS OLD AND HAS SIGNS OF WEAR AND USE. 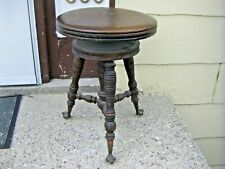 Antique 1873 G. W. Archer Wood And Cast Iron Swivel Seat Piano Stool . Shipped with USPS Priority Mail. Adjustible. Embroidered Wood Foot Stool. Nice Solid Little Stool. Strawberry Pattern. Also, there is a wood ring missing on one side (left side in photo 2) of the stool that hung from the end ball. Photo #6 shows one missing hand carved ring on the right side of the bottom center rung. Does have a slight crack pictured in photo #6. Original dark wood tones. Molded seat. Swivels to adjust up and down. Iron and glass ball & claw feet. Sits flat and flush. Dates to the early 1900s. Has one dimple blemish mark on top of stool (1/8" ding). ABOUT 9" TALL, 14 1/4" WIDE.KILLIAN BROS ????. This is a very nice antique piano stool. It is difficult to find a piano stool with a back rest to it! It is in good condition.has one spindle in the base rest that has an old age crack but otherwise the overall condition is very nice! Very good, clean, no odors. Needs to be recovered else very sturdy and strong. Item : Antique Victorian Small Footstool Ottoman with Puppy Dog Needlepoint. Details : Adorable puppy needlepoint seat, solid wood construction, shapely saber legs, great style and form. Condition :Very good antique condition being structurally sound with age appropriate signs of normal use as pictured. From a Boston estate. Swivel height adjustment still works. One of the balls in the feet isn’t worn down as much as the other 3, stool is very stable and ready for use or display. Mahogany wood according to remnants of paper label. Victorian-era solid walnut footstool. Recently reupholstered with purple and green coloring. Floral carvings encompass all four sides. Condition: very good Dimensions: 25.5" L x 18" H x 20" D Thank you for shopping with Meehan Antiques! Please contact us with any questions. Circa 1900. A place where you can deal and be assured that there are NO REPRODUCTIONS! right away. Victorian-era mahogany swivel piano or organ stool by H. Holtzman & Sons of Columbus, Ohio. H. Holtzman & Sons had a reputation for crafting piano stools and piano covers from the late 19th-Century to the first part of the 20th-Century. Beautiful condition.needlepoint shows no fading. This delightful antique 19th century French piece is finely crafted and detailed. The ceramic stool is shaped like traditional Chinese garden stools, with a top opening handle, and reticulated side designs. Unusual steel or iron rocking gout footstool. Dates to the 1870s or 1880s. Has its original carpet upholstery and horsehair stuffing. This piece has a primitive folk art look to it. The carpet upholstery is very worn but also has a great look to it. Old/paint peeling/rust/greased ready / no seat. 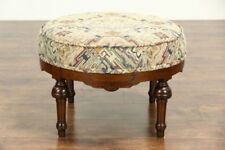 Up for auction we have a Victorian Beadwork round footrest with three Bun feet in good condition for its age. The Beadwork is in good condition but the trim could use some attention. See photos. Victorian Solid Mahogany Adjustable Piano Stool. Patented 1871. Stickers for 1876 Award from the United States Centennial Commission for this stool design. Side turning knobs turn center wood screw. Condition :Very good antique condition being structurally sound with age appropriate signs of normal use as pictured. Overall very nice. Age : Early 20th Century. 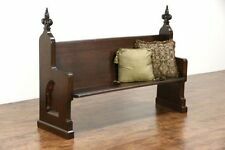 For sale is a rare antique Victorian claw foot bench. Height-21”. This is a very nice antique piano stool. It is in good condition.has old usage wear just the overall condition is very nice! Adjustable height. Very old piano stool! Has fancy legs. Just look at these photos.